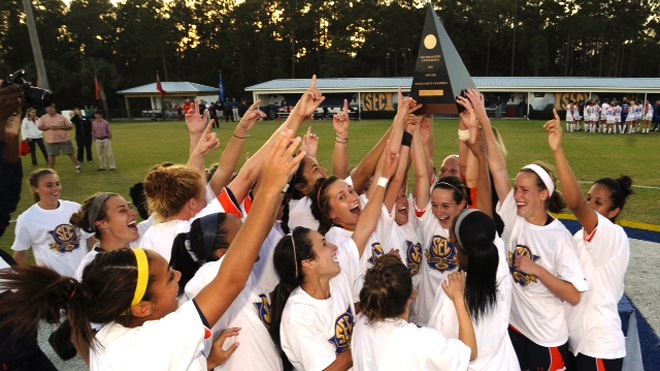 Tonight, Auburn Soccer begins defending its SEC Tournament Champions title. The Tigers are taking on Georgia State in the season-opener at 7 p.m. at the Auburn Soccer Complex. They’re trying to build the foundation for another successful year on the pitch, and another deep run into the postseason. But 2012 doesn’t begin without a look back to 2011—specifically, the Tigers’ 3-2 upset victory over Florida in the tournament final that earned Auburn its first soccer championship since an SEC regular-season title in 2002. The Tigers entered the contest — and the entire tournament — as huge underdogs, seeded seventh in a tournament of eight teams. But two early goals by Katy Frierson gave them a chance. The second-half goal by Ana Cate gave them the match — and the championship. Some might call those three of the biggest goals in Auburn history. Others might call them a changing of the guard. 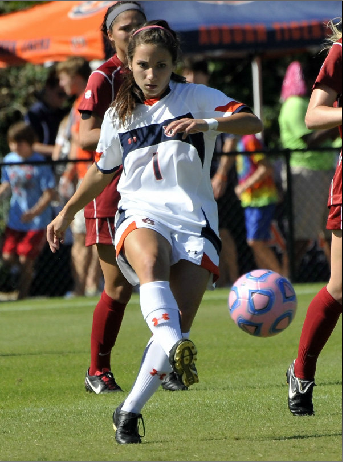 Frierson was certainly one of the most prolific players in Auburn soccer history, finishing as a two-time All-American and earning First Team All-SEC honors in each of her four years on the Plains on her way to a school-record 104 career points accounted for. Frierson was rated by experts as one of the top-five best high school prospects in the nation coming out of Homewood in Birmingham, but she surprised everyone in choosing to stay close to home and help build a young program at Auburn. Four years and one SEC Tournament Championship later, the Frierson Era has come to end on the Plains. But Frierson’s isn’t the only absence that will be felt. 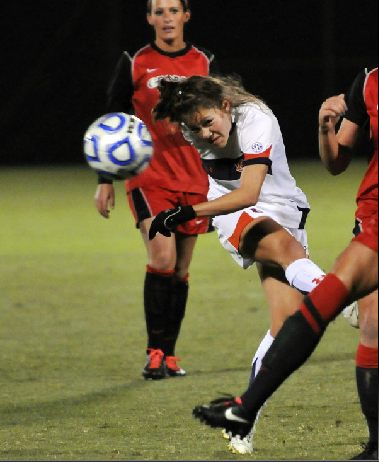 “Really, we had three huge losses,” said Auburn soccer head coach Karen Hoppa. “Heather Havron was our starting right-back for four years, Julie King was an SEC Defensive Player of the Year, and then Katy. For the well-rounded Cate, a returning starter at midfielder and Auburn’s leading returning goal-scorer from a season ago, replacing Frierson means adjusting to new senior roles as a distributor and as a leader. Luckily for Auburn, Ana Cate won’t be alone as the Tigers attempt to replicate Frierson’s production. Cate is joined in the midfield by Jessica Rightmer, a fellow senior who started all 24 matches for the Tigers last season. Rightmer’s hard-nosed defensive play fits as the perfect complement to Cate’s offensive attack in Coach Hoppa’s scheme. “They’re a great combination,” said Hoppa. “We’re lucky to have them both back. They’re the perfect balance. Rightmer is so good defensively because she’s so quick. She can lock on to an attacker and shut her down, and Rightmer is also so great in possession as well. So when she wins it, we keep the ball. Auburn’s hopefully dynamic duo hopes to carry over some momentum from the last year’s strong finish in tonight’s debut. Hoppa says Auburn’s coaches are just as interested as the players in seeing if the work put in since the beginning of fall practice can pay off under the lights. Getting the 2012 season started off in the same way that Auburn finished the SEC Tournament a year ago would mean big things for the Tigers as a team — and for Ana Cate, who scored that tournament-winning goal. I am planning on going to the women’s games Labor Day weekend (the Friday before and/ or that Sunday’s game) and I am looking for a group of fans who want to show up and cheer like Auburn hooligans (hooligAUns?). Contact me on Twitter, Facebook, whatever if you are up for this.